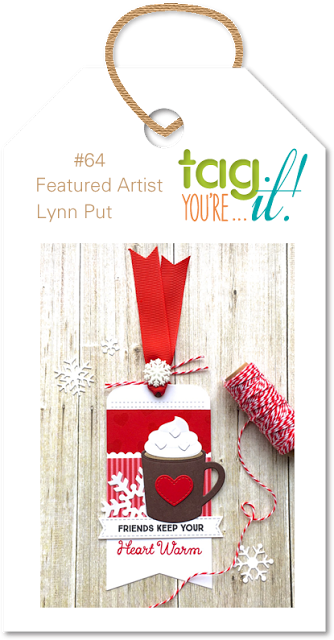 There is still time to play along with challenge #64 at Tag You're It! I am spending this week at my parent's house. I am so happy to share that my mom is doing really well, she seems more and more like her old self every day. We went out on Thursday to do some grocery shopping (my mom's first time out doing her own shopping) and we were laughing so hard we were crying. I had almost forgotten how much fun she is to hang around with, and it was so good to see her so happy. I couldn't let this challenge go without playing along. I was excited to use my new Simon Says Stamp Coffee and Tea stamps. I think a girl can never have too many coffee stamps! 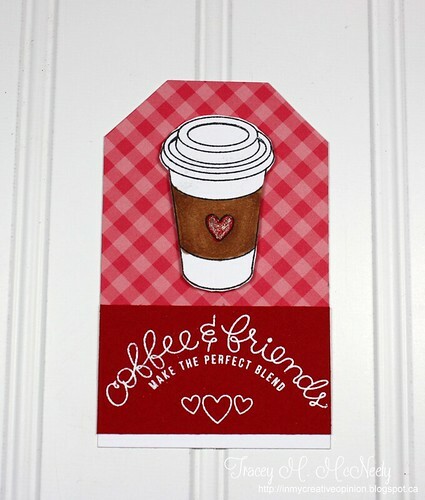 Love this sweet reminder tag!The gingham is so pretty with the red sentiment strip! super cute, love the gingham! Glad to hear she is doing well! I loveeeeeeeee your tag! GORGEOUS!!!!!!!!!! That is cute as can be Tracey! I love the sentiment!! So perfect! The curve is awesome! Love your sweet tag! And I'm so glad to hear your mom is doing so well. Sounds like you two had a wonderful time together! Great tag. Goes well with cookies, don't you think? (The one's you can eat... not a stamp)! Glad you're having a good week at your parent's house.